This dramatic and unique dress is crafted of a gorgeous cream pleated chiffon fabric and has a cool beaded rope trim detailing at the neckline. The included triple-strand rope belt has a large gold charm on it, and can be worn several different ways. The Cream of the Crop Pleated Chiffon Belted Dress is fully lined and has a loose, drapey overlay of semi-sheer pleated chiffon fabric. The flouncy fabric will float and flutter in the breeze—this is the perfect unique party dress for the upcoming holiday season! Add on the included belt with a gold charm and you’ll create a fashion-forward look everyone will love. 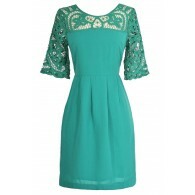 This beautiful dress would be perfect paired with cream or neutral pumps or strappy heels and a cute clutch purse. Fully lined. Belt included. Small measurements: Length from top of shoulder to hemline: 34-36”. You have added Cream of the Crop Pleated Chiffon Belted Dress into Wishlist. 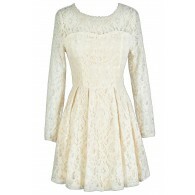 You have added Cream of the Crop Pleated Chiffon Belted Dress for Stock Notification. You have set Cream of the Crop Pleated Chiffon Belted Dress as a loved product. You have removed Cream of the Crop Pleated Chiffon Belted Dress as a loved product.